So pizza is the ultimate easy eating familiar comfort food, right? Not when it has the Four Hundred Rabbits treatment. When you enter this demure establishment be prepared to go on a culinary adventure and have your mouth mind blown by inventive, exciting and brilliant flavour combinations. First impressions are important and mine was positive. Everything about the Nunhead pizzeria is well composed yet unpretentious, from the soft lighting to the can cutlery holders and clipboard menus. The white space is punctuated with punchy bright colours that create an informal and festive backdrop to the casual art of pizza eating. The staff are informally dressed and efficient, knowledgeable and enthusiastic about their product, making confident suggestions for drink and food combinations and recommending starters. And then there is the food... I absolutely did not expect to be waxing lyrical about what I have often referred to as an 'Italian open sandwich' but here I am, about to wax. We started with pickled watermelon skins (£2.75), pickled cucumbers (£2.75) and the wood roasted Padron peppers with Malden sea salt (£4.50). 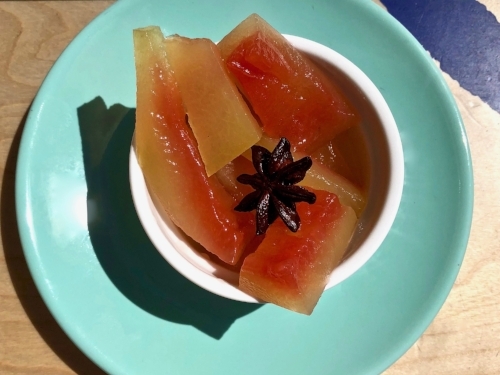 The watermelon was the star of the starter show and was like nothing I have ever eaten with strong spices mingling with sour vinegar and the soft flesh of the melon, I was baffled and delighted at the same time. The cucumbers were perfectly pickled and the Padron peppers were sweet with a slightly bitter finish which complimented the sour pickles perfectly. For the main we had the two vegan pizzas available on the menu. The first is the stalwart, topped with radish, courgettes, garlic and pine nut pesto, pumpkin seeds, tomato and thyme (£8.50) and the second is a seasonal special, topped with a green chilli and coconut base, aubergine, watermelon, kalamata olives, basil and black pepper (£9). All the Four Hundred Rabbit pizzas are made on a sourdough base which adds even more flavour and texture to the proceedings. Firstly, we need to talk about watermelon, more specifically watermelon on pizza, this is a total revelation when coupled with salty olives on a meaty sourdough. I was really surprised by the depth of flavour and the way that the sweet watery melon worked with the other elements of the pizza. I have never been surprised by pizza before. This special collaboration is only on until the 3rd August so if you are intrigued or inspired to try this pizza you'll need to shake a leg. The radish and courgette pizza may have been my long term favourite only because it needed less intellect to process and after all the watermelon related excitement I was ready for an easy (ier) win. The pesto that topped this pizza was absolutely divine, very rich and creamy and the additional scattering of pumpkin seeds was inspired as they provided more texture and fats making it a very satisfying pizza indeed. Both were a riot of colour and a celebration of the unexpected. To round off the meal there are the ubiquitous vegan sorbet options, either strawberry or blood orange. We opted to try the orange which, again, was a masterclass in getting it right with strong bitter marmalade notes against a subtle sweet backdrop. This was an adult dessert to finish off an adult meal. The drinks menu is as interesting and well selected as the food with vegan options clearly marked. We tried the sour and very refreshing Gypsy Hill Pineapple Gose as well as the light and bright (and gluten free) Hawkes Urban Craft Cider. Both were perfect for a hot evening in the city. All in all this small local chain is doing very big things in an easy and approachable way. If you love food and even better, if you love being surprised by what you eat, then this south London pizzeria is the place for you. Pay them a visit before 3rd August to sample the wonders of watermelon as the specials will be changing in early August.